Many IT organizations are excited about the prospects of incorporating Cloud-based and virtual computing technologies into their present/future vision. At the same time, many of these same organizations have been educated and taken many steps on the road to IT service management maturity. But Cloud is a means to improved efficiency, not an end in itself, and companies should not overlook the need to connect business goals and priorities. 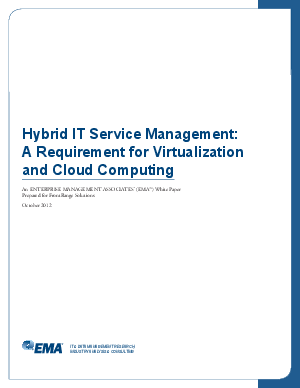 Download this whitepaper and learn how you can capitalize on your hard work in domain management, service management and virtualization to leverage Cloud services for increased resiliency and efficiency.